For this section of the painting I have added a medium wash in French Ultramarine Blue to the napkin. The napkin is plaid, so I will have several washes to glaze on to make the total effect. I used a very wet wash and the puddles actually help to glaze shadow and texture in this wash. 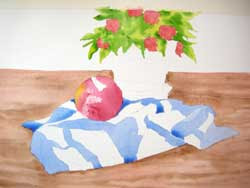 I used darker values behind the apple and on the edges of folds. It's good to squint your eyes to better see the values in your reference photos. Looking beautiful! Thanks for the demo!